Birch organic fabric fabrics are 100% organic cotton fabrics. Discover this "Whistle" new collection that will carry you in a soft and colorful universe. In high quality poplin cotton, this fabric is ideal for making clothes and accessories for children. 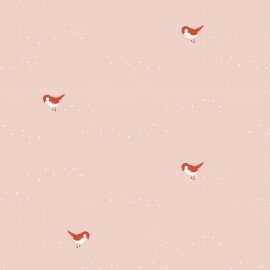 Fall for this Tiny steps fabric with small red robins on a light pink background. 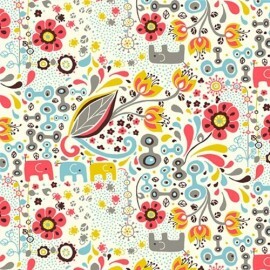 Birch organic fabric fabrics are 100% organic cotton fabrics. Discover this "Whistle" new collection that will carry you in a soft and colorful universe. In high quality poplin cotton, this fabric is ideal for making clothes and accessories for children. 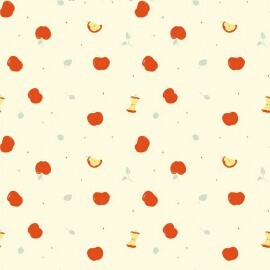 Fall for this Apples fabric with red apples on a light yellow background. Birch organic fabric fabrics are 100% organic cotton fabrics. Discover this "Whistle" new collection that will carry you in a soft and colorful universe. In high quality poplin cotton, this fabric is ideal for making clothes and accessories for children. 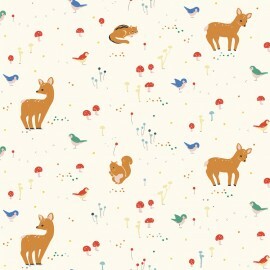 Fall for this Sunny Forest fabric with small forest animals on a light yellow background. 100% organic fabric, treated with love, not pesticides !